Going downhill is the really fun part of skiing, but the uphill part of the equation makes more vertical feet downhill possible. While chairlifts may be the classic type of ski lift, they are just one way to get high. (Enter quip about Colorado and Washington’s laws here). Here’s a rundown of the most common types used at ski areas around the world. Other than hiking, a rope tow was the earliest and most primitive method to go uphill. Rope tows are still found at many small ski areas. Among destination resorts, Alta Ski Area in Utah actually has a prominent rope tow going between the Albion and Wildcat base areas. A moving sidewalk, commonly known as a “Magic Carpet,” thankfully has replaced rope tows in most beginner areas. T-bars, J-bars and platter pulls were the next steps in the evolution of surface lifts. Such devices predate snowboarding, so surface-lift design tends to be less than ideal for boarders. The most famous T-bar in the United States is probably the one accessing Horseshoe Bowl at Breckenridge Resort in Colorado. Platter pulls (the ones with the disc that goes between a skier’s legs) are often called “Poma lifts” after the company that first made them. Of course, Poma now also makes sophisticated high-speed chairlifts and gondolas, but the name has stuck. The inspiration for the chairlift was a cargo conveyor system used to load bananas onto ships in Panama. In 1936, skiers were first able to go bananas over this wonderful new invention installed in Sun Valley, Idaho. Boyne Mountain bought the original single-chair lift for $2,000 in 1947 and brought it to Michigan. The terminals of the lift are still used for the Hemlock double-chair there. Surprisingly in light of Boyne’s modest 500 vertical feet, the ski area’s founder, Everett Kircher, was central to the evolution of chairlifts. He put in the first triple-chair at nearby sister resort Boyne Highlands in the 1960s. Boyne Mountain can also claim the first fixed-grip quad (four-seat chair) and first high-speed six-pack. High-speed lifts are also known as detachable lifts, because the chairs detach from the cable at the top and bottom stations in order to slow down for loading and unloading. The chairs reattach at different points on the cable, but given that all the chairs slow down by the same amount, the spacing remains the same. The advent of detachable high-speed chairlifts in the early 1980s cut ride times by more than half, forever changing resort skiing. Rather counter-intuitively, the faster detachable quad lift has the same uphill capacity as a fixed-grip quad. In other words, high-speed lifts get individual skiers up the hill faster, but do not necessarily put more people on the hill. The chairs on a high-speed lift are spaced farther apart, so they don’t bunch up too much at the terminals. To think of it another way, four skiers or snowboarders can load the lift about every six seconds no matter whether a quad is high-speed or fixed-grip. Therefore, as long as the number of seats per chair is the same, the capacity per hour ends up being equal for both types. By the same logic, the length of the lift doesn’t affect uphill capacity. Yes, it seems wrong, but it’s true. 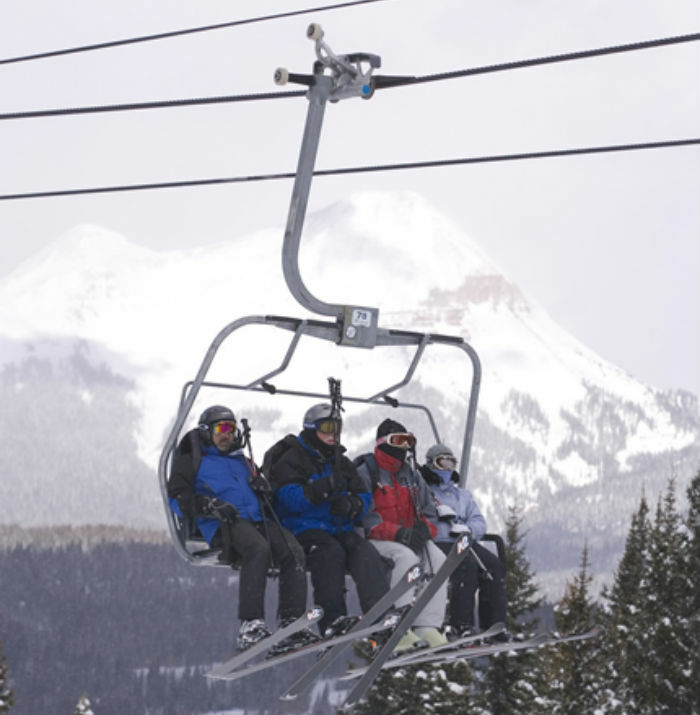 The exception would be the rare high-speed chairlift configured to allow more than one chair to be loaded at the same time and thereby increase capacity. Also, the reality is that fixed-grips often can’t run at full capacity, because fixed-grip chairs are more difficult to load and unload. People are more likely to fall getting on and off, so the lift must stop temporarily more often. Holding up to a dozen guests in each car, gondolas are basically chairlifts with enclosed cabins. The downside of course is the necessity to take off skis or snowboards. The six-person Silver Queen Gondola on Aspen Mountain is probably the iconic U.S. example of this mode of transportation. With just a couple of large cars on the cable, an aerial tram can hold about 100 skiers and boarders (often standing in uncomfortably close proximity) in each cabin. Challenging resorts and trams seem to go together, because Jackson Hole, Snowbird and Squaw Valley are all known for their trams. Don’t T-bar surface lifts hall more skiers per hour compared to double chairs? What is the typical number of skiers per hour for rope tows?